You should wash your sheets once every couple of weeks to remove allergens and prevent dust mites from thriving where you sleep — not to mention to rid them of your natural oils and sweat — but did you know that your duvet or comforter could use a wash every once in a while too? Keep your bed completely free of allergens, dust mites, oil, and sweat and wash your comforter a few times a year. This can seem like an annoying chore, but it’s as simple as washing your sheets with these following tips. 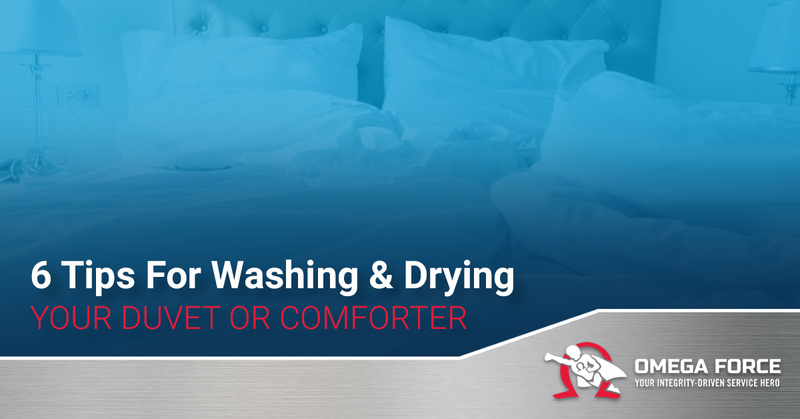 Of course, if you’re in need of washer and dryer repair, you won’t get far trying to clean your comforter. Call Omega Force Appliance Repair in the Twin Cities today to schedule an appointment. Before you just throw your comforter into the washing machine and press “start,” take a look at the instructions on the tag. Most tags write out instructions to help you easily understand how to clean your comforter. If your comforter is made of wool or silk, your washing machine is going to damage or shrink the material, so take them to a dry cleaner to be professionally cleaned. If the tag says you can use a washing machine, pay attention to what cycle and temperature it should be washed in. If your duvet has stains on it, use a spot remover on it first. You can buy stain removers or make your own — like a vinegar and baking soda mixture, or regular club soda. If you have a tear or broken threads on your duvet, sew it shut before throwing it in the wash. No one wants a washing machine full of loose fluff, let alone a ruined duvet. It’s important to wash your comforter in a large enough washing machine so it stays big and fluffy. If you put your comforter in the washing machine and there isn’t a little extra room, the filling is going to get compressed and your comforter won’t be entirely cleaned. This could also cause your machines to lose balance from being overloaded and require washer and dryer repair. Instead, take your comforter to a laundromat with commercial washing machines and dryers so that it has adequate space to spin. If you’ve overloaded either of your machines and can hear a large clunking sound, they may be out of balance. Give Omega Force Appliance Repair in the Twin Cities a call for washer and dryer repair. When it comes to detergent, a mild or natural one is recommended to keep the fabrics of your duvet soft. Select a gentle cycle and an extra rinse, if possible. Also, cold and warm temperature settings will protect the color and fabric of your duvet, but hot water will kill dust mites — just don’t plan on machine drying your duvet afterward. If you do decide to dry your comforter in a machine after it’s been washed, throw a few tennis balls — or down fluffer rings — in with the load to help evenly distribute the filling. Check the tag to see what temperature your comforter should be dried at and set it for a few hours. While your duvet is drying, you’ll want to check it about every half hour and fluff it. This will help distribute the filling evenly, as well as ensure that it dries evenly. If you washed it in a commercial machine, also use a commercial dryer so it has enough room to spin evenly. Use these tips to have a fluffier and cleaner duvet or comforter today. Remember to check the recommended wash settings on the tag, and use tennis balls in the dryer to keep the duvet and comforter equally fluffed. If you’re experiencing issues with these large appliances, contact Omega Force Appliance Repair in the Twin Cities about our washer and dryer repair services. We guarantee super service so you can get back to having a ball washing your comforter.